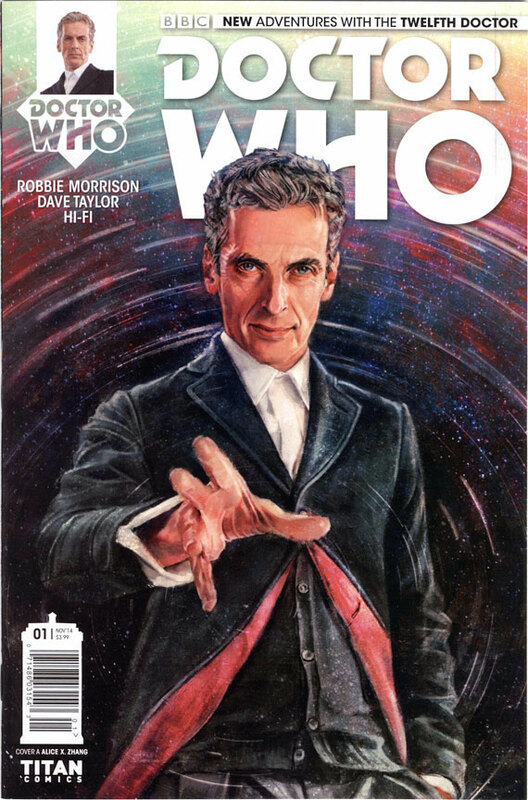 This must be one of my timeliest reviews ever – I'm posting this the morning of the day the comic in question, Doctor Who: The Twelfth Doctor #1, arrives in comic shops (whereas in the ordinary run of things my reviews tend to appear months, if not years, if not decades after a comic or, more typically, book has been published) – which, considering that comic stars a Time Lord, is doubly apposite. 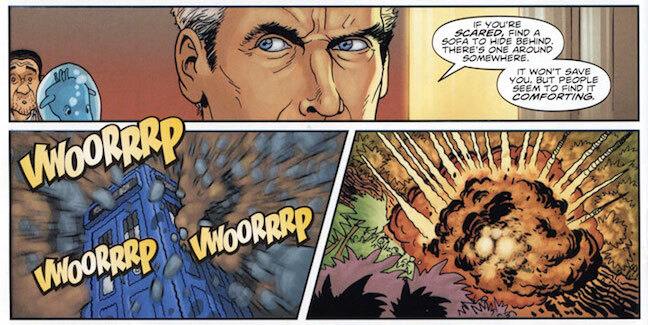 And the twelfth incarnation of that Time Lord, no less, the one currently being brilliantly played on telly by Peter Capaldi, here making his comics debut... if we discount the comic strip starring the Twelfth Doctor which has been running in Doctor Who Magazine for a couple of months, that is. 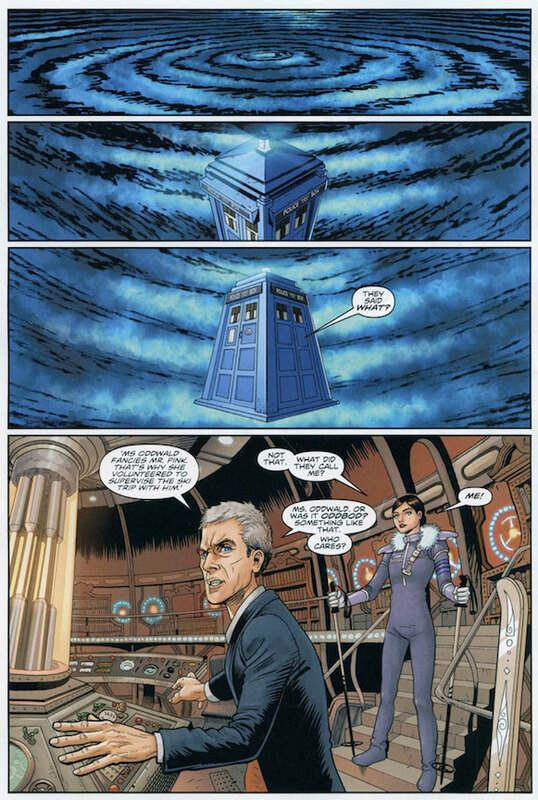 But no matter: this is the Twelfth Doctor's comic book debut, the latest addition to Titan's fast-expanding line of Doctor Who comics, and it's a nicely crafted, faithful and, on the whole, successful affair. One's reaction to it, I suspect, will very much depend on one's reaction to the TV Twelfth Doctor, so convincingly do writer Robbie Morrison and artist Dave Taylor channel him: irritable, irascible, airily dismissive of almost everyone he meets and prone to dispensing withering putdowns left, right and centre – in other words, as enormously entertaining on the page as he is on the screen. Taylor, an artist I've admired since I encountered his work on the late-1990s Dark Horse series Tongue*Lash (an aside: when I myself was working at Titan in the mid-2000s he was on my list of artists I'd loved to have found projects for), is good on Capaldi (those eyes...) but less so on the Doctor's assistant, Clara Oswald; he hasn't quite got the hang of Jenna Coleman's subtly characterful phiz yet, although there is the odd panel where Clara clicks visually. In any case, Morrison's dialogue captures her perfectly, notably her trademark exasperation at – and attendant sarcastic rejoinders to – the Doctor. The story is a bit Star Trek III: The Search for Spock-y, involving as it does accelerated planetary terraforming gone awry, but much like the current series, where even the more workmanlike stories are made magical by Capaldi's towering, glowering performances – and Coleman's quieter but no less important countering foil – here a so-so story is enlivened by choice character interplay and some cracking dialogue. And the story shouldn't really be discounted out of hand; there are seeds being sown here – bits of Gallifreyan business, some kind of ancient evil – which may produce satisfying fruit down the line. First issues are always a tricky business, still more so first issues of licensed comics, where there are more often than not innumerable additional hurdles, hoops and other more confounding and baffling obstacles which must be negotiated over and above the usual editorial ones. 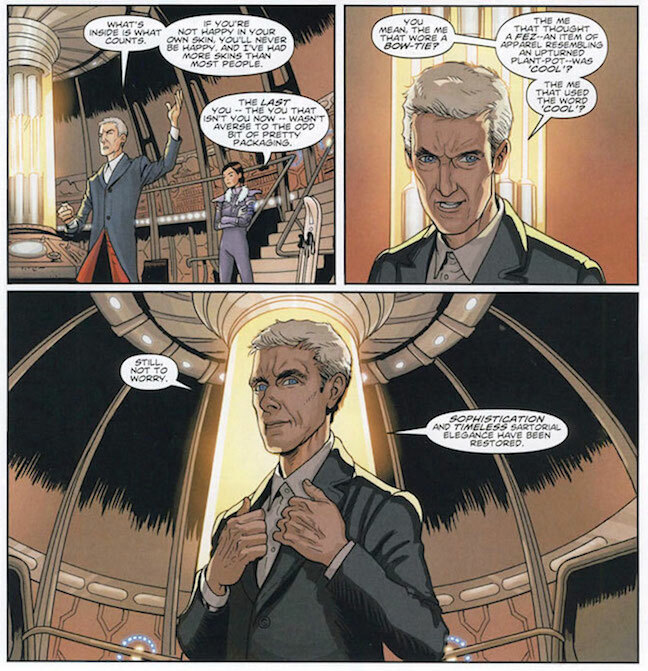 Rare is the licensed comic which emerges from that process unscathed, so the fact that Doctor Who: The Twelfth Doctor #1 retains much of the feel and heart(s) of the TV show is only to be applauded. A creditable job all round. Incidentally, in addition to the regular cover by Alice X. Zhang there are 30 variant covers, all of which can be seen in the back of the comic. Admittedly the vast majority of these are retailer specific covers – i.e. produced for individual comic shops and online retailers – and I can see how the economics of that would work for Titan, but still – that's quite a lot of covers for one comic.